Abdikarim Sheikh Muse “Qalbi-dhagax” born, raised and studied both primary and secondary levels in Mogadishu. 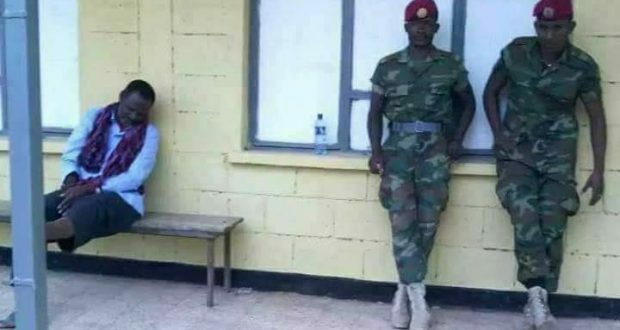 “Qalbi-dhagax” is a Somali citizen; he was he was an officer of the Somali National Army (SNA) who fought against Ethiopia to liberate Somali territories and restore greater Somalia. He paid efforts for the war between Somali Republic and Ethiopia in 1977 to liberate western Somali territories and restore greater Somalia. He defended this country against enemies for many years. During the war between Somali and Ethiopia, Mr. Abdikariim suffered serious injury and also lost his brother. Following the outbreak of the civil war in 1991 and the collapse of the Barre regime, he decided to join ONLF and become among the top officials to continue the war against Ethiopia to liberate the Somali territories and restore it back to the hands of the Somali people. After years of fighting, he found himself with diabetes and he decided to leave the ONLF and move into the Somalia in order to escape as a member of the executive committee of ONLF to get access for a better health services and re-settlement. He had survived various assassination attempts to kill him; Xamarpost.com paid efforts to investigate the details of those assassinations. Ethiopian intelligence has received information indicating the whereabouts of Mr. Abdikarim; Ethiopia organized their intelligence units with the support of Somali officials to capture Mr. Abdikarim. The first attempt of assassination took place early 2011 during his stay in Kismaayo the capital city of Lower Jubba Region and the Jubba State of Somalia. The Ethiopian intelligence received credible information showing that Mr. Abdikarim is in Kismaayo. Ethiopian and Somali officials were deployed at Kismaayo to shout him, but he managed to escape due to his tactics. “His close protection team advised to move into the big cities such as Beletweyne, the capital city of Hiiraan Region and he has been living there 2011-12” sources from his family confirmed. He managed to escape another three attempts in Beletweyne before he left it. He moved back to Mogadishu in 2013 and he managed in to Mogadishu. Immediately the Ethiopian intelligence received his information due to their strong link with the Somali officials. What has happened again? The operation this time was to kidnap and bring back to Ethiopia to face prosecution in front of Ethiopian judiciary. The aim of the operation was to discourage the ONLF officials who are playing a leading role the fight against Ethiopia. Mr. Abdikarim himself was very able to receive information about the operations against him through Somali sources. They attacked his location, but fortunately he moved out before they reached to another location within Mogadishu. According to Somali officials the operations against Mr. Abdikarim have been increased after sources confirmed the exact location of Mr. Abdikarim in Mogadishu. This operations was the end of his era in Somalia after he was captured by one of the government agencies and was brought to Xamar, he was then handed over to the Ethiopian regime after they put pressure on the Somali government. Ethiopia was ready to pay any amount of money that could make it possible to kill Qalbi Dhagax. He stayed for a few months in Galgadud, but there have been trial to kill but not succeeded. “On 2015, he traveled from Gaalkacyo to Mogadishu and he has been living under fears and worries” Xamarpost confirmed through his family sources. One of the officers said that several times he met with “Qalbi Dhagax” told him that he is fearing one of the cabinet member of Abdiweli Sh. Ahmed government, although the officer declined to tell his name but he said he is now a member of the Somali parliament. Late 2015, there was a meeting held inside Halane of Mogadishu International Airport, sources confirmed that Gen. Gabre organized the meeting with ministers and senior officials of Somali army. He informed them that Mr. Abdikarim who committed crimes against Ethiopia stays in Mogadishu. He also requested the facilitation of the operation, in turn, he pledged that ethiopia will pay a huge amount of money. What facilitated the capture of Qalbi Dhagax? Mr. Abdikarin recently has travelled to Kalkacyo to meet his family and senior ONLF officials to discuss issues related the war against Ethiopia. He was captured by GalMudug security and he was visited by traditional elders of the city and then GalMudug promised that they will release him. One of the security forces disseminated the information with Somali Federal Government but immediately Somali Government ordered to transfer him into Mogadishu. A special jet carried him to Mogadishu, then transferred to Baidoa and finally to Ethiopia. N.B: Please note that Xamarpost.com has received the information through Somali officials and his family representatives. Anyone who wants to use this information must protect the rights of this person, unless otherwise stated by Copyright. WARBIXIN: Qorshii ay Ethiopia ku dooneysay Qalbi dhagax oo 6 Sano Kadib Guuleystay Imisa Afduub iyo dil ayuu ka Badbaaday?